ConceptDraw DIAGRAM is known as a professional flowchart software. It allows you to create flowchart diagrams of any complexity effortlessly and quickly. 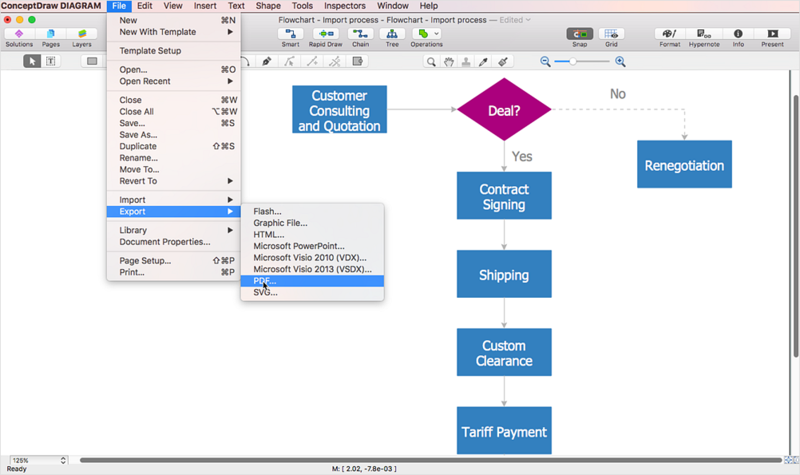 A free trial copy of flowchart software is available for download to all registered visitors of the ConceptDraw website. Please Sign In and fill out the registration form and follow the steps to activate your account. Once you have activated your account you are then able to download and install ConceptDraw DIAGRAM as well, as flowchart plugins from ConceptDraw Solutions. You can start with an opening template, or with finding the suitable flowchart sample from the Solutions. Then depict your process steps quickly and easily due to ConceptDraw flowcharting tools: Rapid Draw technology designed to accelerate the process of flowchart creation; Smart Connectors that change form as you rearrange your flowchart components; The Clone Tool that lets you to quickly add multiple copies of the same type flowchart components. ConceptDraw Flowchart libraries contain high-quality vector flowchart symbols that provide users with presentation-quality flowchart outputs. With just a few simple steps, you can export your flowcharts to Microsoft PowerPoint®, PDF, or web page.